Once you’ve bought your beautiful new car, it’s easy to forget everything else that needs doing. A new car can leave you low on cash after hefty down payments. You can spend months saving for it and hours negotiating the price. However, that is all pointless if you don’t find the right insurance policy. After the stress of buying, diving into insurance policies will be the last thing on your mind. But, it is very important. You can lose a lot of money with the wrong insurance cover. There are hundreds of different insurers out there and twice as many policy options. You need to find the right one for you. By that we mean the right price and the right cover. Don’t fight for every penny on your new car and then pay over the odds for insurance. Work your car insurance into the initial budget of your new car. Don’t get caught out later with large bills. This article will guide you through the process. By its very nature, car insurance is complex. You need to understand the minefield and navigate through it. We’ll help you learn what to look for and what policy is right for you and your car. We’ll then help you cut costs and keep your premium low. Without further ado, let’s get stuck into the basics. At a very basic level, insurance is a premium you pay to cover yourself against future costs. You’ll pay a monthly fee or a lump sum to a car insurance company. In the event of a road accident, breakdown, theft or fire, your car insurance company will cover the costs. Of course, it is not always as simple as that. We’ll get into specifics further down the page. Car insurance is a legal requirement. You absolutely must insure your car before you even get behind the wheel. Driving without it will land you with a fine, prosecution and a very expensive premium in the future. Governments are quick to crack down on this type of behaviour and you could see your car taken off you. It’s simply not worth the risk! If you own a vehicle but it is currently off the road, you still need to declare this. Search for a SORN certificate online and fill this out. Car insurance quotes are generally worked out by assessing risk. Insurance companies cover the cost of your accidents and damage in exchange for monthly payments. Therefore, the most risky drivers incur the biggest monthly costs. If you are a risky driver, the insurance company anticipates having to spend more money on you. That cost is passed onto the driver through higher premiums and monthly payments. It is a system that is entirely based on generalisations. In many cases this seems unfair but it is simply the only realistic way of ranking insurance brackets. These brackets are constructed through the following risk factors. Age, gender, occupation, postcode and the model of car you drive. Young drivers, in general, are considered more dangerous. This is backed up by statistics; a higher percentage of young drivers are involved in accidents. The insurance company balances out this percentage by charging higher prices to young drivers. Statistically men have more high impact accidents than women. Traditionally men’s premiums were higher as a result. This has since been ruled out due to anti-discrimination legislation. Drivers with a more dangerous occupations are also subject to higher premiums. Jobs that require a lot of driving incur higher charges, for example. The area in which the car is kept also plays a large part. 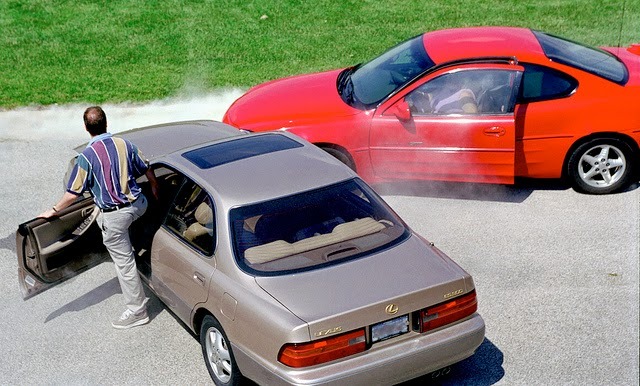 Insurers assess the likelihood of car theft and damage in a particular area. Dangerous neighbourhoods and street parking will negatively affect the price of your insurance. Finally, the make and model of the car is a determining factor. Insurers take into account the reliability of certain car manufacturers. They assess the price of the vehicle, the performance and the safety features. Naturally, a more powerful car registers a higher price. Car insurers have around 50 brackets in which every car fits into. Before you buy, check where your car falls and ask yourself if you can afford that particular premium. After the risk factors have been assessed, you must decide what type of policy is right for you. There are three variations here. The first is ‘Third Party Insurance’. This is the bare minimum that you must purchase. In the event of an accident, it will cover any damage to third parties. That’s any damage to the car, building or landmark you hit. It does not cover any damage to your car. This type of insurance is generally used when your car isn’t worth very much. The second type is ‘Third Party Fire and Theft’. This insures you for all of the above. It also covers you against fire damage and any costs if the car is stolen. This is common amongst first time car owners and young drivers. It is relatively cheap and covers most eventualities. The final type is ‘Fully Comprehensive”. This insures you against almost all problems on the road. It covers third parties and your own car. This is the insurance that gives you the best peace of mind. Large companies and businesses may need to consider a specialist insurance. This is to insure their entire fleet of company cars are covered. Find more information about insurance on contract hire and leases at Listers. As you can see, there are many factors that affect the price of your car insurance. With this in mind, there are some things you can do to bring the price down. First of all, upgrade the security of your vehicle. Installing an alarm and immobiliser will drop the price significantly. Try to find off street parking in a garage or covered space. Limit your mileage and only claim when you absolutely have to. Building up a no-claims bonus will work out cheaper than claiming a few hundred pounds. Finally, make sure you shop around. Being loyal doesn’t work out in the world of car insurance. At the end of every policy, look for a better deal. We hope you now have a stronger understanding of car insurance. It is a complex world, but it pays to fully comprehend its workings. Only by understanding it, can you find the tricks to making it cheaper. Happy hunting!